Joseph Wills was at work in Philadelphia during the mid 19th Century. 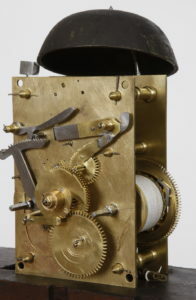 He made both 30-hour and 8-days clocks. The reference literature: Palmer, Eckhardt, Gibbs et. al. all cite 1700 – 1759 as the dates for Joseph Wills. 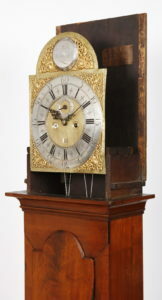 In 1750 Wills advertised in the Pennsylvania Journal that his apprentice Thomas Winterbottom, a clock maker by trade, had run away and offered a reward of 10 Pounds for this return. 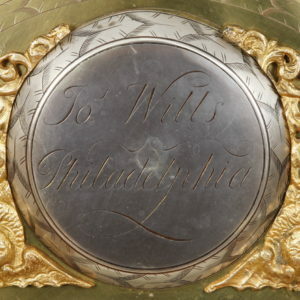 The cases that were employed by Wills were typical local Delaware Valley Queen Anne designs: Flat top and “Caddy” or “Sarcophagus” top forms. Local native Cherry and Walnut were the choice primary woods, while Cedar and Yellow Pine were used as secondary woods. 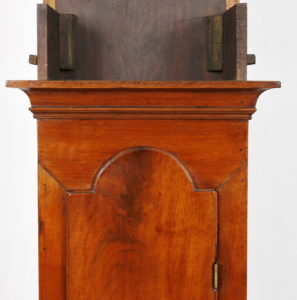 This example executed in Walnut stands at 104 1/2 inches to the top of the center finial. The bonnet with tombstone shaped bonnet door and side lights has front columns integral with the door and rear columns that are quarter set into the back return. 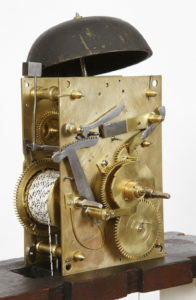 The eight day brass striking movement is coupled to an early brass dial with applied spandrels, applied chapter ring, applied name boss that is engraved by the maker “Joseph Wills, Philadelphia.” The circular rings around the winding arbors are an early period detail found in this clock. 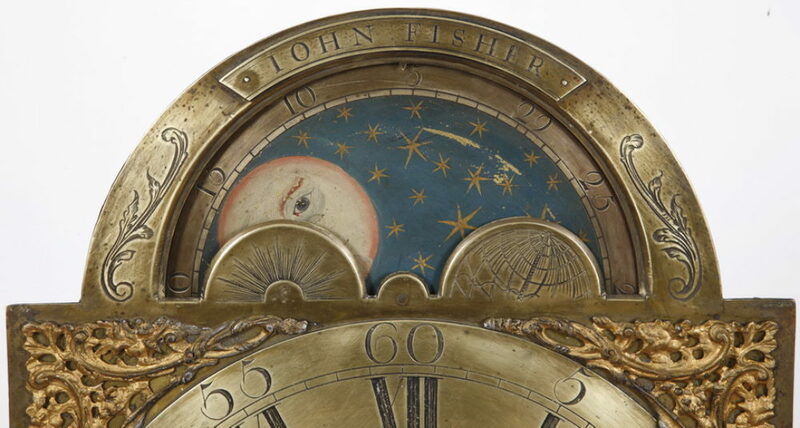 Note the engraving in the calendar aperture which is another fine detail only found in early 18th Century clocks. 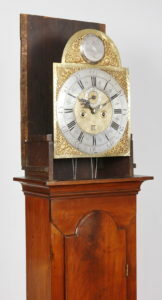 The clock have been completely restored and in good running condition. 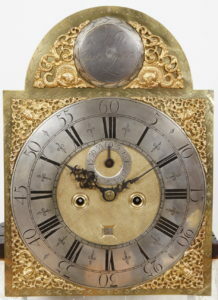 An original pair of cast lead weights has survived with the clock along with the original pendulum.